This month we had the opportunity to implement our design sprint process for new charity client No5, allowing us to educate our newest team members and create an entire brand direction from scratch. Local social service No5 is one of our closest partners; their mental health support and counselling helps hundreds of young people in Reading every year. Our relationship has developed over the past 18 months as we supported the charity through fundraising events and volunteer work. 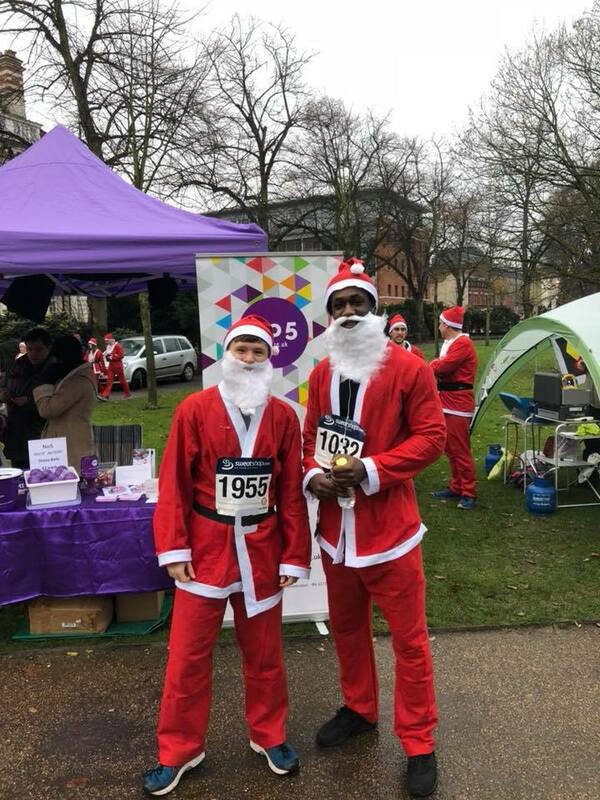 Mark and Daniel fundraising for No5 in the Santa Run. No5 realised that their brand and website weren’t quite fit for purpose, being problematic to maintain, inconsistent and frankly underselling the great work that No5 have been carrying out for over 47 years within the community. As a close partner with the charity, No5 asked Red Balloon if we could assist in giving their brand direction and provide support so that they could more effectively use digital to communicate with their audience. As No5 is a complex organisation with a vital mission, pivotal services and rich history, it was decided that a week long design sprint would be the best way to achieve the short and long term goals of the project. We went through our design sprint process with No5’s Lead Young Ambassador, Carly, and Outreach Coordinator, Hayley. Young Ambassadors are the young voice for the charity, passionate about supporting others as previous users of No5’s services. This and the Outreach Coordinator’s knowledge of how the charity operates made them the ideal pair to help us to understand their audiences and get the most out of the week. Our plan for the first few days of the design sprint. 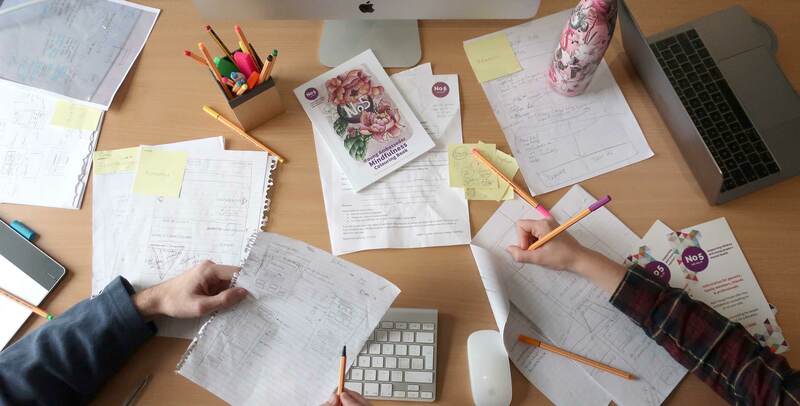 In order to familiarise the team with the client and their requirements, each design sprint begins with a catch up and sharing of information. On Monday morning Hayley and Carly arrived to discuss No5’s mission and objectives, and answer a multitude of our team’s questions. Our team learned about No5’s role in the community and took in their priorities for the project, including the need to encourage fundraising without increasing the workload of No5’s busy staff. We spent some time going through their existing website as a reference point, before focusing more on “competitor” charities for inspiration and to build on initial ideas. It was immediately clear that there would be a large amount of content and vital information for the new site to house. The morning’s research aided our later evaluations of No5’s current brand. The client guided our team on which elements they wanted to retain or build on, from the application of colour and visual elements, to the logo and language used. Brainstorming and close collaboration helped us in establishing a consistent tone of voice, relevant to the wide span of No5’s audiences. 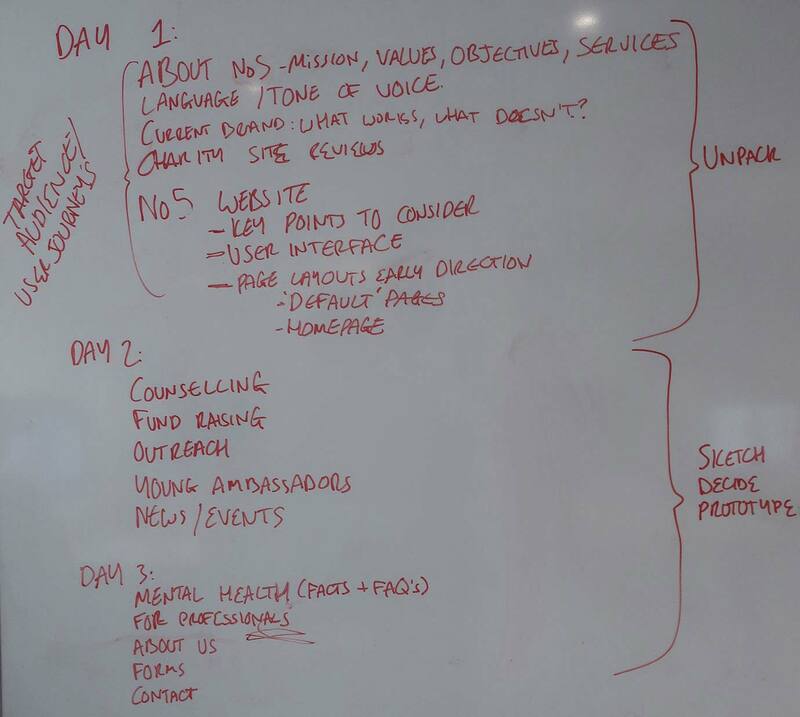 We finished the day by exploring the needs of No5’s various users and their expected pathways further, creating a vivid picture of how people will use the site and how No5 will present what they have to offer. First thing on Tuesday the team and client discussed potential user journeys to better understand the requirements of each section and start to develop the website hierarchy. Our research enabled us to move forward by creating an abundance of sketches. Working page by page, each member of the Red Balloon team individually sketched a design, while Hayley and Carly worked together. This preserved different styles and perspectives before collective decisions were made. This process helped us decide how and what needs to be said in specific parts of the website to maximise its effectiveness. The client’s presence at this stage was very beneficial, as sketching brought forward more suggestions and clarified their vision. This is not to mention their invaluable experience in the language and practice surrounding mental health. The decision making was initiated by bringing together our collection of sketches and composing a more complete wireframe for each section. After lunch the director of No5, Alyson, came to the Red Balloon office to discuss these unified wireframes and provide additional feedback. The director’s expertise guided us in making the right decisions following the bounty of ideas generated earlier in the week. Always conceiving new ideas, it was at this stage that an ‘Urgent Support’ button was suggested for the header, incase people in immediate crises came across No5’s website. The advancement of these decisions helped us to move forward onto the prototyping stage, while still remaining flexible at every junction, as is the nature of the ‘agile methodology’. 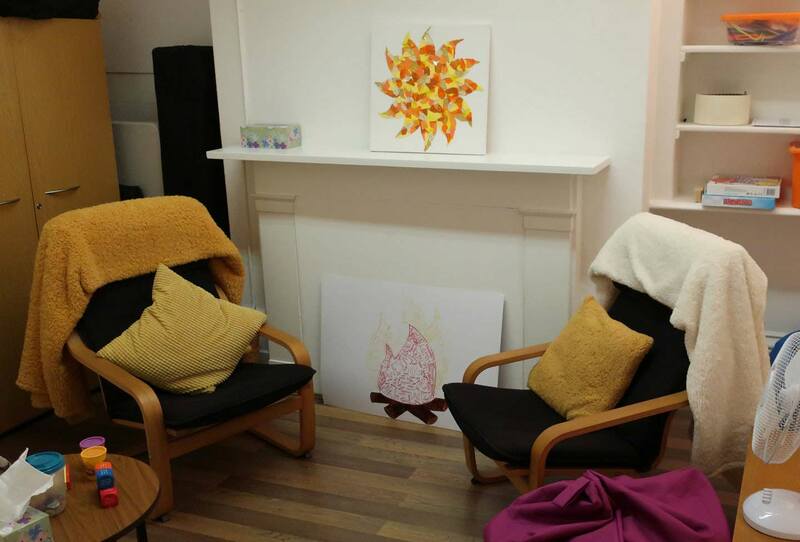 On a team trip to No5’s building, we were able to take inspiration from their counselling rooms and treasured artworks, as well as deepen our understanding of the charity. 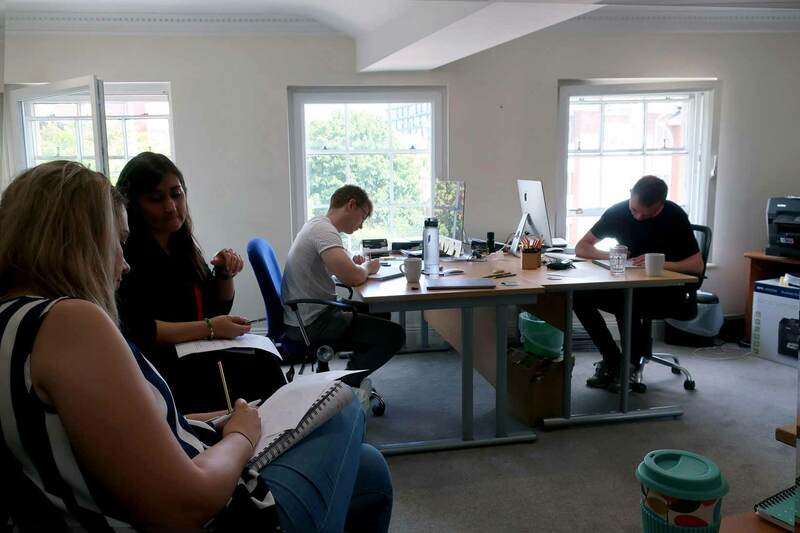 As an intense week drew to a close, the team were excited to begin prototyping. Having already gone through much of the decide stage, developments to the wireframes were able to quickly progress in fidelity, and discussions could begin concerning colour and typography. As only designers do, we poured over various purples, their meanings, and how the colour palette may best be used. As an experienced typographer, Red Balloon’s director Bill was able to familiarise the team with the nuances of different typefaces as we narrowed down our choices for the brand, keeping in mind our client’s vision and the tone of voice we’re aiming for. It was identified early on that the old header was in serious need of a complete rework. The idea was to create a clear user interface (UI) that resolves all the issues of the old navigation system and grants easy access to all essential pages from anywhere on the site. 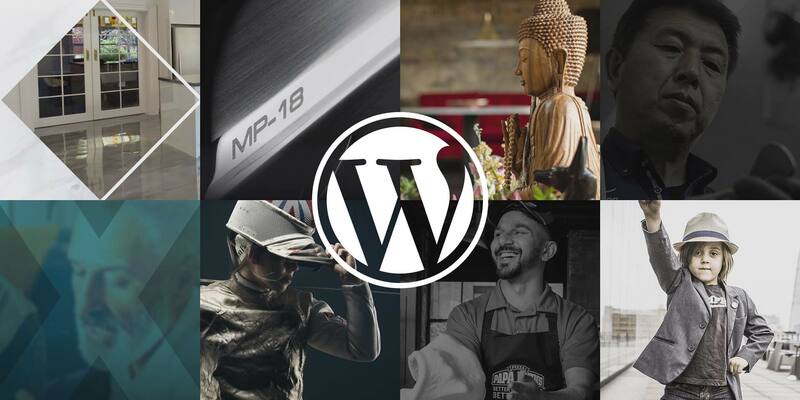 Now with a styled prototype and a clear, agile plan, the team is able to make rapid progress with this exciting project as we continue through the design, for this header and for every section of the site. 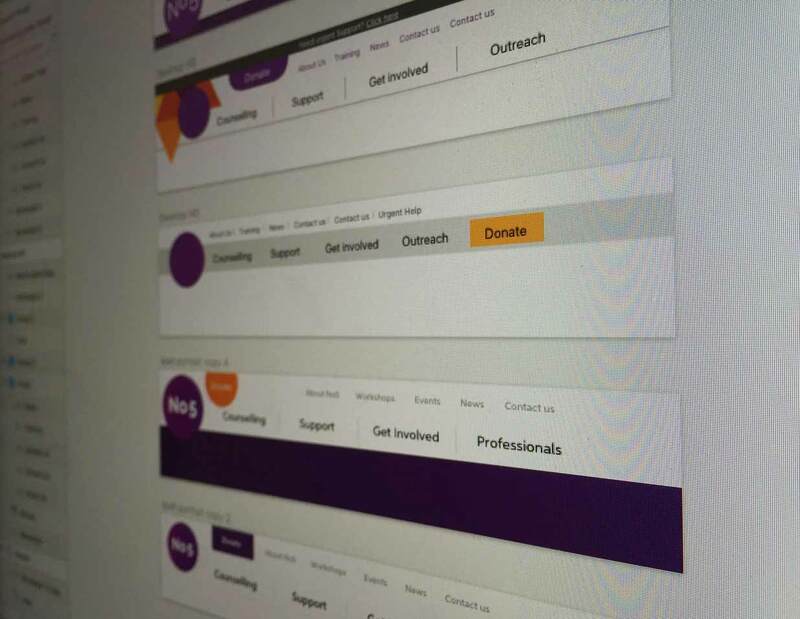 Work in progress designs and iterations for the new navigation header. Collaborating on this design sprint process will have benefited both us at Red Balloon and the client, enabling our team to develop, and their team to promote their services, maximise their fundraising opportunities, and educate the community. We will continue to build and develop this website and No5’s brand until its launch, expected in October. 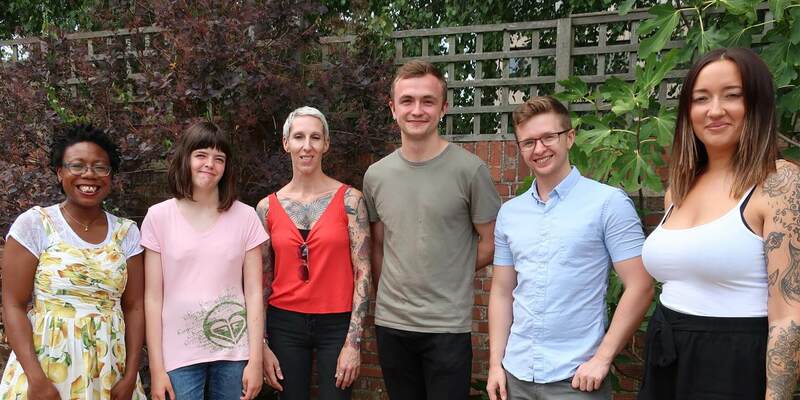 We are looking forward to being able to see No5’s visions come to fruition, as well as the positive effects that follow for No5 and their service users. Follow us on our social media profiles for future updates on our collaboration with No5! Find out more about Red Balloon’s design sprint process and contact us if you are interested in running a design sprint at your organisation! Dominik joined Red Balloon with a vast creative background and helps us and our clients deliver the ultimate brand and customer experiences.